As worrisome as the new ag secretary's 'easing' of Obama-era school food nutrition standards sounds, it really just maintains the status quo. Given the Trump administration’s zealous quest to roll back many other food policy advances achieved under President Obama—restaurant menu labeling, improved Nutrition Facts boxes, food safety measures, and more—it’s understandable why Perdue’s announcement has caused a lot of consternation among those who support healthier school meals. 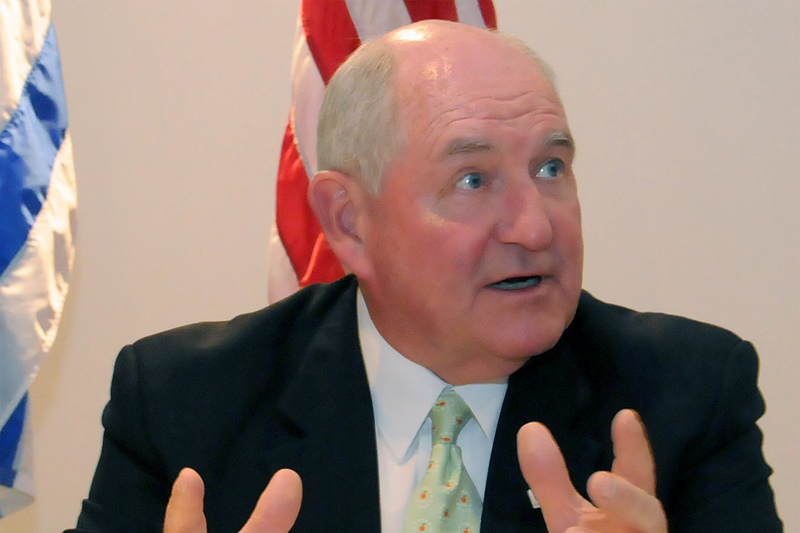 The fact that the USDA’s press release about the announcement was titled, “Ag Secretary Perdue Moves to Make School Meals Great Again”—coupled with President Trump’s avowed love of fast food—likely only ratcheted up the alarm. But while I’m certainly no supporter of any weakening of the Healthy, Hunger-Free Kids Act (HHFKA) nutrition standards, I do think it’s important to put this latest development in context. Let’s start with whole grains. The HHFKA standards currently require that all grain foods served to kids (pasta, bread, etc.) be “whole grain-rich,” meaning they must contain at least half whole grains. That standard never struck me as extremely rigorous; there are varieties of whole grain “white” flour out there that, at least for my own kids, can easily be slipped into baked goods without notice. But some school districts have long complained that procuring palatable whole grain-rich products on the open market has been a challenge, at least in some parts of the country. Perdue announced yesterday that districts facing this problem will be able to obtain a waiver to serve grain foods that are not whole grain-rich. But while that might sound like a big step backward, this is exactly the same system we’ve had in place ever since the 2015 appropriations bill (remember the “CRomnibus?”). So while health advocates (rightly, to my mind) believe the 100 percent whole-grain-rich standard should be enforced across the board, Perdue’s announcement didn’t change the status quo. Finally, while opponents of flavored milk in schools were likely alarmed by Perdue’s statement to reporters yesterday that “I wouldn’t be as big as I am today without chocolate milk,” it’s important to remember that even under the HHKFA standards, kids can take flavored milk daily. Now, however, schools will be able to offer flavored milk in a 1 percent variety (as opposed to fat-free), which was already the case with white milk. The upshot? The Perdue announcement does move school meals in the wrong direction, but most of the very significant gains made by the HHFKA remain intact. We still have common sense calorie limits for school meals, for example, as well as a ban on trans fats and a requirement that kids get a greater variety of vegetables each week. And despite years of lobbying by the School Nutrition Association, Perdue made no change to one of the most important advances of the HHFKA—a requirement that kids must take a half-cup serving of fruits or vegetables at lunch, instead of passing up those healthy foods on a daily basis. In other words, we’re not going back to the days of the “all-beige” tray. That said, there may be future Trump administration efforts to further weaken HHFKA advances, including a possible gutting of the “Smart Snacks” rules that cleaned up the junk food sold to kids via fundraisers, vending machines, school stores and a la carte lines. And we may also see attempts to undercut other laudable provisions of the HHFKA such as the Community Eligibility Provision, which currently allows schools and districts in high-poverty areas to provide free meals to all students, without paperwork or stigma. My message to concerned parents is this: voice your opposition to Perdue’s actions, but don’t over-inflate them. We may have bigger battles yet to come. Sonny Perdue photo CC-licensed by the U.S. Embassy to Uruguay. When it comes to waste in schools, no conclusive research has shown any increase in waste as healthier food rules have been implemented. School nutrition directors continue to validate this. In fact, many school nutrition directors have seen their school meal programs increase in participation since the initial changes. Most importantly, we must address one critical question: should we lower nutrition standards for our children or, instead, ensure the more than 30 million children who are moving through the lunch line every day are fed as they deserve? We must take charge of the rising and alarming rates of childhood obesity, diabetes, heart disease, behavioral disorders, and more affecting our kids. We must choose the latter. The Life Time Foundation is committed to continuing to fight this fight alongside our school partners to eliminate the Harmful 7 from the food served - so every child receives the healthy food they deserve. We choose our kids. And, we choose good nutrition. Politicians will come and go and policies will change, but we can choose healthy, nutritious meals for our kids. We know that doing so will help them grow stronger and live healthier lives.